For other uses, see The Dakotas (disambiguation). The Dakotas is an ABC/Warner Bros. western television series starring Larry Ward and featuring Jack Elam, Chad Everett , and Michael Greene, broadcast during 1963. The short-lived program is considered a spin-off of Clint Walker's Cheyenne. The Dakotas was cancelled one week after heavy viewer protest over an objectionable scene. The series follows the efforts of U.S. Marshal Frank Ragan (Larry Ward) and his three deputies, J. D.Smith (Jack Elam), Vance Porter (Mike Greene), and Del Stark (Chad Everett) as they try to keep order in the Dakota Territory during the Gilded Age prior to statehood in 1889. 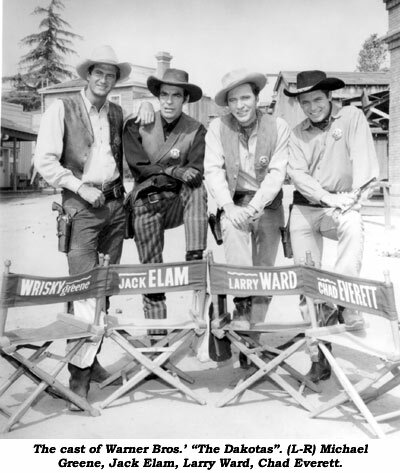 All four characters initially appeared in an April 1962 episode of Cheyenne entitled "A Man Called Ragan". However, the degree to which this episode makes The Dakotas a spin-off of Cheyenne is debatable. In the pilot on Cheyenne, the titular character of Cheyenne Bodie never appears. Also, the episode had followed five consecutive weeks of Bronco episodes, broadcast as a part of the wheel series that Cheyenne had effectively become. Moreover, the length of time between pilot and series—almost eight months—further weakened the link between Cheyenne and The Dakotas. The biggest tip-off to viewers as to the parentage of the series was that it had assumed the Monday 7:30 p.m. ET time slot previously occupied since 1959 by Cheyenne. Among the many guest stars, George Macready appeared as Captain Ridgeway, with Jeanne Cooper as Rebecca Ridgeway, in the third episode, "Mutiny at Fort Mercy". Chris Robinson was cast as Chino in "Red Sky over Bismarck", with Andrew Duggan as Colonel Winters and Kevin Hagen as a preacher. Warren Stevens and Karen Sharpe played Cain and Angela Manning in the episode, "Crisis at High Banjo"; Robert J. Wilke was cast in the same episode as Judge Markham. When viewers saw the program's eighteenth episode, "Sanctuary at Crystal Springs", they were shocked by a scene that depicted the lawmen killing two outlaws in a church, one of whom had caused injury to a pastor, played by Charles Irving, before dying. Calls for The Dakotas to end its run were answered virtually overnight. After just one more episode, the show was pulled. A twentieth episode, entitled "Black Gold", had been completed, but was never shown. Several episode titles refer to geographic place names in the Dakotas. On March 24, 2015, Warner Bros. released The Dakotas- The Complete Series on DVD via their Warner Archive Collection. This is a manufacture-on-demand (MOD) release, available through Warner's online store and Amazon.com. ^ "The Dakotas (TV Series 1962– )" – via www.imdb.com. ^ "The Dakotas (WB)(1963) Larry Ward, Jack Elam, Chad Everett, Mike Greene". 4 September 2004. This page was last edited on 9 March 2019, at 09:29 (UTC).